Odin is the all-seeing father. Thor is the lightening god with the magic hammer. Loki is the trickster who is out to help himself. They are all waiting for the end of times, when they will fight and die only for the world to be reborn again. Dive into the stories of these heroes and myths and find out their origin stories. I am a huge fan of mythology. I fell in love with it back in middle school when we studied Greek and Roman mythology. I thought the stories were fascinating and was even more fascinated by how they connected to our time today. You could see how they influenced people and then see how those influences changed over time. I knew a tiny bit about Norse mythology but not a ton. I knew who Odin, Thor and Loki were but that was really where my knowledge ended. When I picked up this book I wasn’t quite sure what to expect. I didn’t know if it was a generic retelling, a story that used Norse mythology characters or a reworking of the stories. In the end it is a collection of Norse myths that Gaiman compiled and made his own. I really enjoyed the collection because I felt like it gave just enough about the myths. I didn’t tell them all but it told the important ones (as far as I can tell). You got to hear the origin stories, the adventure stories and more about Ragnarok. It did a good job at giving me a crash course in these myths. I think I felt like I could connect to the stories because he modernized the language a bit. I felt like he didn’t use the vernacular from that time and gave it a modern twist. I felt a bit like in portions I was reading about the versions of Thor and Loki from the movies. I liked this because I felt like I could sink into the tales a bit more because I wasn’t spending as much time trying to figure out exactly what they were saying. One of the book series I loved as a teenager was called Everworld by K.A. Applegate. It was a quick read but I remember it involving a lot of different myths and legends. As I read through this book I started remembering some of the characters like Hel. I remember them from that series and now I want to reread that series to see how things compare. 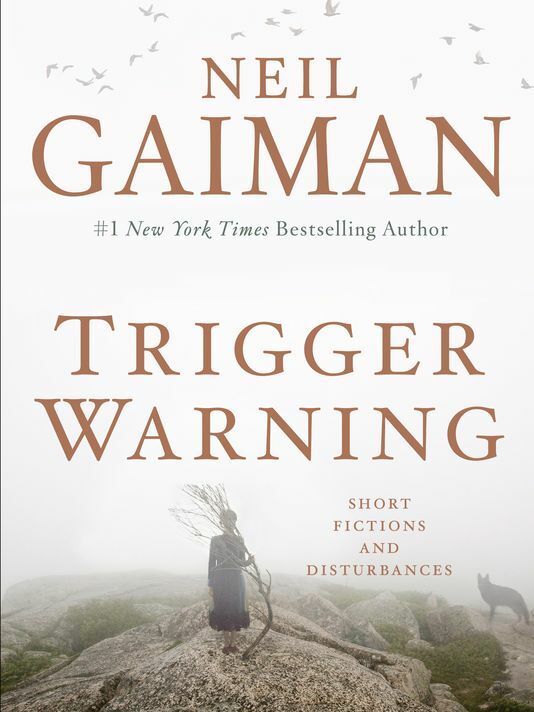 At the beginning of the book Gaiman mentions that he took a few liberties with the stories. He talks about how he rearranded bits and combined stories. At the back of the book he quickly tells where he got each story from but nothing much about what he might have changed or altered. He quickly mentions some but I wanted a bit more. As I stated I have very limited knowledge about Norse mythology and I wanted to know a bit about what he changed or what he kept the same. I think it would have been nice after each story to have a one pager thing stating what he changed and maybe why. Would have just been interesting to know. I can’t think of anything that I wanted to change. It kept my attention. I was able to follow everything and I felt like I learned quite a bit. 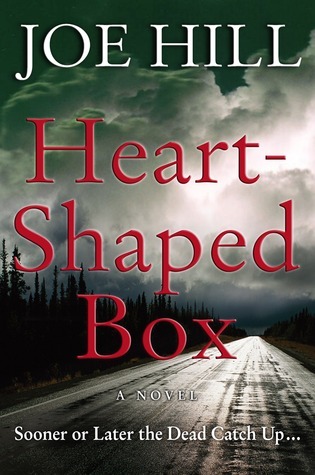 I gave the collection 4 stars on Goodreads. I had fun growing my knowledge of this type of myth. 3 Days, 3 Quotes Challenge (Day 1). 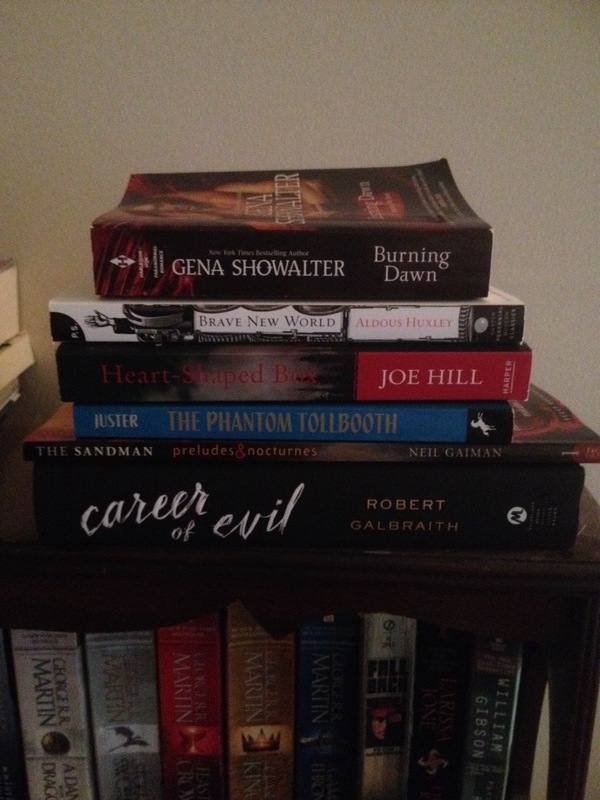 Thank you to Trisha over at Yellow, Green and Read All Over for tagging me in this challenge! Be sure to check her blog out! Deciding on my first quote wasn’t too difficult. This is a quote that I have loved for a long time. 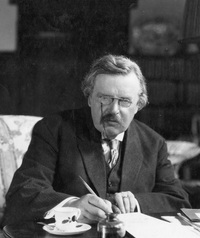 It is one that has been paraphrased different times by different people. My favorite iteration of it is Neil Gaiman’s version from Coraline. I love this quote because of what it says about reading and the power of stories. I wrote about this in a longer post before but I love the idea of stories that villains and problems can be overcome. We get so bogged down in what is going wrong around us. We stare up at our problems and worries and we wonder how in the world we can ever get around them and defeat them. When you read, you are all of the characters. You follow the protagonist as they fight, fail and get back up again. As you read you learn from their mistakes. You stand beside them as they try again and again to defeat whatever is standing in their way. We learn from them. We watch as they rise to the top and they end in victory. And it gives us encouragement and hope that we can take up our own swords and defeat our own dragons. Book and stories are fantastic because they show us that nothing is impossible. Our heroes can be battered and broken but somehow and someway they are able to defeat whatever was standing in their way. Even when the ending is not a happy one, or one we wanted, we still learn lessons. Lessons we can then use to defeat our own dragons. Time to nominate 3 other blogs. Share your favorite quotes over 3 days or if you have done it already or you are not interested, no worries, no need to do it. 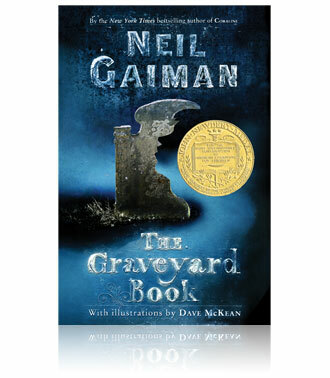 “The Graveyard Book,” by Neil Gaiman is the coming of age story for a young boy named Nobody Owns, Bod for short. 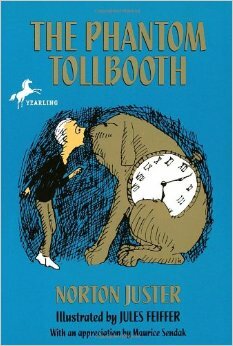 It is the story of a young child who grows up in a fantastic world where the only boundaries are the outside world. He comes of age in a place where the impossible is possible. We, as readers, are taken along on his journey of learning life lessons as any child would; as well as learning that the world is not as black and white as we like to think it is. Bod’s parents and younger sister are killed by a man named Jack. Bod is a baby and crawls his way out of the house and to a graveyard where the man isn’t able to hurt him. Bod is adopted by the inhabitants of the graveyard and he is given the protection that goes along with that. As long as he is there he is safe from the man Jack and his organization. Bod grows up in the graveyard learning life and scholarly lessons from those who were buried there. In the end the man Jack and his organization do come for Bod. Bod is able to defeat them using what he has learned through his upbringing in this strange place. 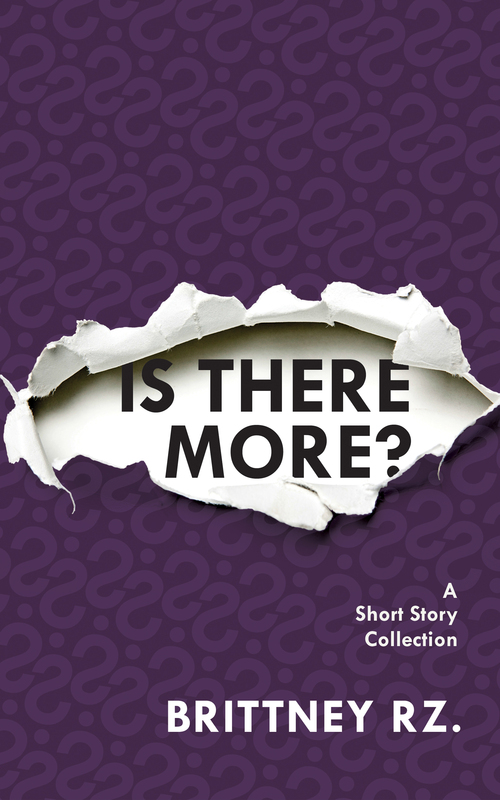 Many of the first chapters of the book are vignettes about Bod growing up and learning lessons about life. Bod learns that just because you dislike what an adult is telling you, find it boring and pointless does not mean it will not be useful later. He learns that by not listening to what he is told could end up with him in a life threatening situation. He also learns that while he may screw up and get himself into trouble those who care about him are always watching and will protect him if they can. In the end all these lessons he learned are what enable him to defeat the man who wants him dead and save not only himself but his home as well. I think the theme and main idea of this book can be summed up by the relationship between Scarlett and Bod. When the two first meet they are both young and innocent. Scarlett believes that Bod is an imaginary friend and she barely questions what he does or says. At this age she accepts Bod and all the weird aspects of his life and home. Her and her family move and it is stated that “[…]she fled down the path back the way they had come, to her parents and the world.” (pg 60). She leaves a world where the impossible is possible and is thrown into a world where reality tells her that somethings just aren’t real and never can be. When we meet Scarlett again she is a teenager and she has been in the world for a while. Like all children they believe that all things can happen until adults and the real world tell them otherwise. Scarlett is now skeptical and she is actually surprised that Bod is real and not imaginary. She is must less trusting. After the fight she goes through with Bod she becomes terrified of Bod. She is scared of all the things that she has seen and experienced. She can’t take it all in and in the end has to have her memory wiped. The real world has stepped in and put set limits and regulations on her. She knows what is real, what isn’t and she can’t fathom any of that changing. She can’t make the two worlds mesh together. Bod on the other hand has grown up with all these fantastic elements as his reality. Talking to ghosts? Normal. Being able to Fade? Normal. Being able to go into a different realm through an old grave? Normal. For Bod all is normal and whenever he is presented with something new he take it in and examines it. He doesn’t run and hide. Which will serve him well when he does step into the rest of the world. He asks his guardian, “How can you make her forget me?” (pg 289) after he watches Scarlett break down before him. His guardian tells him. “People want to forget the impossible. It makes their world safer,” (pg 289). This is one of the last lessons Bod has to learn in his home. He has to learn that sometimes the world can’t accept the fantastic and that to be safe people ignore what is troubling and weird. Bod has to realize that the world outside of his graveyard is much less trusting. The book ends with Bod leaving his home and venturing out into the world. He is excited to see what is beyond the gates. He wants to explore and see what is out there. He has seen all he can inside of the graveyard and he knows that it is time for him to take on a new adventure. Whereas Scarlett was scared of the unknown Bod embraces it. 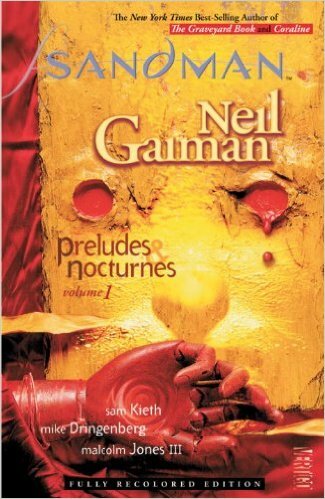 I enjoyed this book because of how well Gaiman combined reality with fantasy. He told a coming of age story unlike one we have seen before. As Bod leaves his home we, as readers, know that not only will he be able to take care of himself but he will be able to show the world some things as well. Sometimes our world needs these eccentric, seemingly odd people to open up the possibilities that surround us. Shadow is a man who gets out of prison only to discover the life he had planned on is no longer remotely possible. He finds out his wife and best friend are dead. His entire life comes crumbling down and is in a pile at his feet. While he is traveling to attend his wife’s funeral, as well as to try to figure out what to do with his life now, he meets Mr. Wednesday. After agreeing to help Wednesday he is pulled into the preparations for a coming battle between the old world gods and the new world gods. American Gods appealed to me because of the overall concept of the story. Any time anyone takes the idea of gods or mythology and gives it a modern twist I am instantly interested. Many of us know the stories of the gods well. We know the personalities they were supposed to have and we all have a similar pictures of who these gods were in the past. They are generally depicted as these intangible creatures. Yes, they interact with humans but they are never really on our level. They are all powerful while we are lowly humans that do their bidding because our lives are run by them and only them. Neil Gaiman takes these gods and humanizes them. We as reader cannot only relate to them but we begin to sympathize with them as well. As I read I felt sad for most of these once powerful beings. One of my favorites parts of this story was how it was explained why these old gods are fading and why they need to take part in this battle. When all the immigrants who made this country came over they brought their gods with them. It was their connection to where they had come from. They brought them because they gave them comfort and helped them feel like they weren’t just floating along in the universe. That first initial generation held onto their beliefs very strongly. They tried to honor them and also tried to pass their stories on to the next generation. But this was no easy task. They become surrounded by a number of new cultures and beliefs and all the gods begin having to compete with each other for followers. Throughout the novel we get those small looks at these people who brought their gods to this world. We also get a glimpse of what the gods were like when they were initially brought over. We see how much life changes for them and get to watch as they all struggle to somehow make their old ways coincide with the new world ways. These small vignettes give us a better look at what Mr. Wednesday tries to constantly explain to Shadow. America is a nation of a number of cultures, all with their own beliefs, rituals and traditions. When they all combine it becomes a struggle to survive and a struggle to find a way to define themselves. 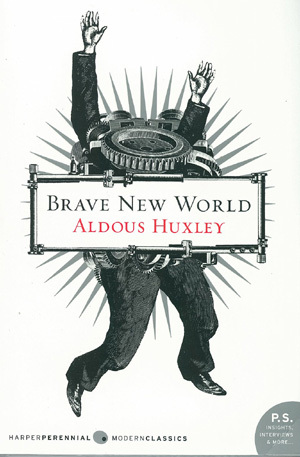 Mr. Wednesday tells Shadow that, “This is the only country in the world….that worries about what it is,” (pg 105). It is extremely difficult to find a way to define yourself when you have so many different view points living in one area. In the old world they are defined because it has been that way for so long. 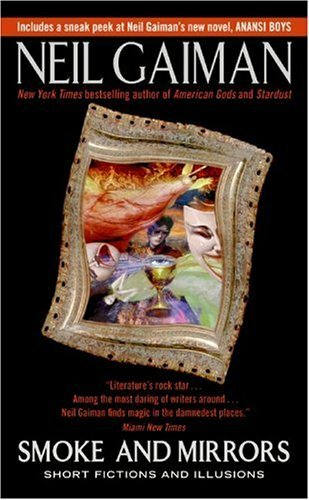 Gaiman gives us a glimpse into how religion really works in this novel. A true religion thrives off of having a number of people worshipping at its alters. The old gods need hundreds of prayers and sacrifices. But when you have a bombardment of ideas and beliefs it becomes almost impossible to prescribe to one idea and one idea only. There is a great passage on pages 348-349 (in my tenth anniversary copy that is) where the character Sam (a hitchhiker) tells Shadows what exactly she believes in. It is a mess. Her beliefs are constantly contradicting themselves over and over again. “I believe in a woman’s right to choose, a baby’s right to live, while life is sacred there is nothing wrong with the death penalty if you can trust the legal system implicitly and that no one but a moron would ever trust the legal system,” (pg 349). This whole passage illustrates perfectly what these old gods are now facing. Even the new ones aren’t able to live as long as their counterparts have before. People have too many choices nowadays and choosing one belief system or thought process is extremely difficult, if not impossible. In the old times there were strict rules and rituals. Life revolved around making sure that you made it until the next day and didn’t catch some deadly disease or end up on the wrong side of the law. Those people were given a very small amount of choices because they had little time left to them. Our world today is much more hectic and we live much longer. We have time on our hands to actually look at the world around us and question everything. The old world did not question like we question today. 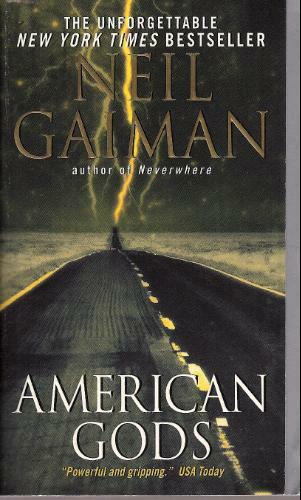 Gaiman wrote this ten years ago and the theme is even stronger today. Wednesday wants to rally all the old gods together to fight the new because he doesn’t want to fade away. He doesn’t want to be forgotten but being forgotten and replaced is inevitable. 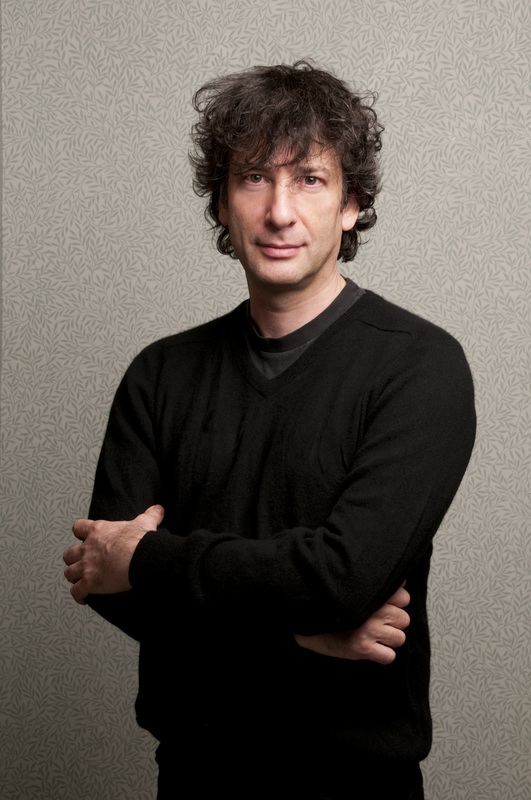 Neil Gaiman shows us how indistinguishable the old gods are from the people we see on the street everyday. Yes, some of them still possess some power but not anything truly significant. Many still believe in the life they used to live and the principals they live by. But now they had to adapt and have to live side by side with normal human beings. Gaiman creates these very vivid and breathing people who just want to survive. I love how he makes them so tangible to the reader. These gods (some I knew, some I did not know) are no longer those larger than life people who control the world. They are now at our level. We possess the power now. Humans decide if these once all powerful beings live or die. This is a unique take on a concept we really don’t give much thought to nowadays. 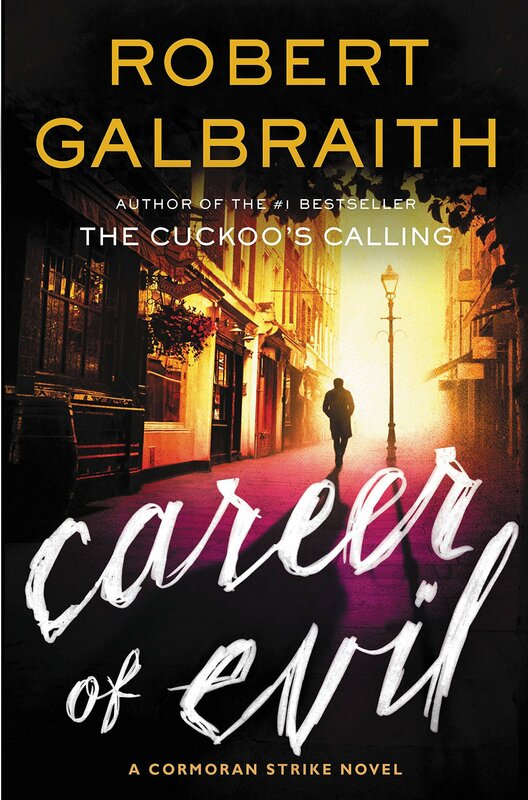 I have heard that this is one book that either people loved or hated. I happen to be in the loved category. Yes, the end seemed at first kind of anticlimactic but after I thought about it, it made sense to me. I felt like it ended exactly how this situation should have ended. There was a bit of a drag tying up a few loose ends but I still ended up satisfied. As I have stated in reviews before I love developed characters that have extreme depth and this book gave me that beautifully. We see Shadow shift from a man who is just floating along because he has no idea what else to do, to a man who actually opens his eyes to the world around him and begins seeing it as it is. Shadow begins living for himself and only himself. I love how much depth these gods had. They aren’t just one dimensional beings that are set fully on only one thing, such as war or love. Those aspects just amplify who they already are. I highly recommend this book to anyone who wants a new way to think about America and religion as well as anyone who loves a story with well written living and breathing characters.